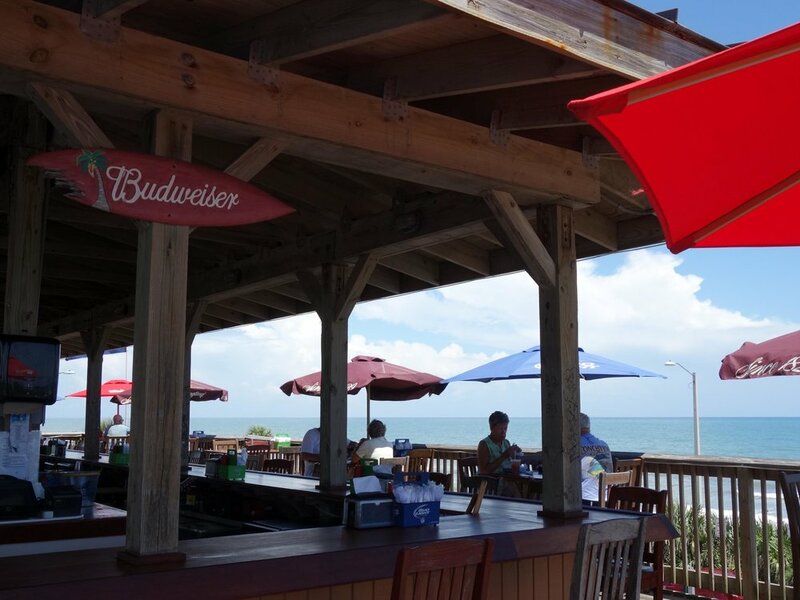 Finn's Beachside Pub is a Florida beach bar located in Flagler Beach. Discover this great Florida beach bar. Located in Flagler Beach, Finn's lower level is very attractive and has a more high end look than most beach bars. But don't let that fool you. The beach bar is on the rooftop. Up here it is all about the beach and a good time. Finn's has the food and the beverages you are looking for and also the fun. This Florida beach bar has entertainment nightly. Sometimes the entertainment is Karaoke, and sometimes it is great local bands. On most weekend afternoons, you are apt to find a band playing at about 2 pm at the rooftop bar. No matter what, you will have a great time at Finn's. The views at Finn's are fantastic. On a beautiful Saturday afternoon we enjoyed some delicious food, cold drinks and fabulous views. The Chris Hiatt Band was playing and everyone was enjoying this great music. In fact, the band was playing "Knocking on Heaven's Door". In this most spectacular setting overlooking the Atlantic Ocean, we did indeed feel like we were knocking on Heaven's door. Music in the downstairs bar starts about 9:30 p.m. on weekends. Always check Finn's web site to get accurate times and days. But if sports games are your thing, you will find Finn's to be a great place to watch your team! FYI---the downstairs section of this Florida beach bar is now non-smoking. Tuesday and Thursday nights at 9:00 p.m. you can Karaoke with Harryoke. Harry has been a favorite at Finn's since 1999. This Florida beach bar is popular with the motorcycle crowd. We consider that to be a good thing. The bikers seem to know the best places to hang out and enjoy good food and music. In fact, Wednesday night is Biker Night. The views are spectacular at this Florida beach bar!! Grab a seat at the upstairs bar and sit back and enjoy the views of the Atlantic Ocean and the pier jutting out into the ocean. It's all good at Finn's.